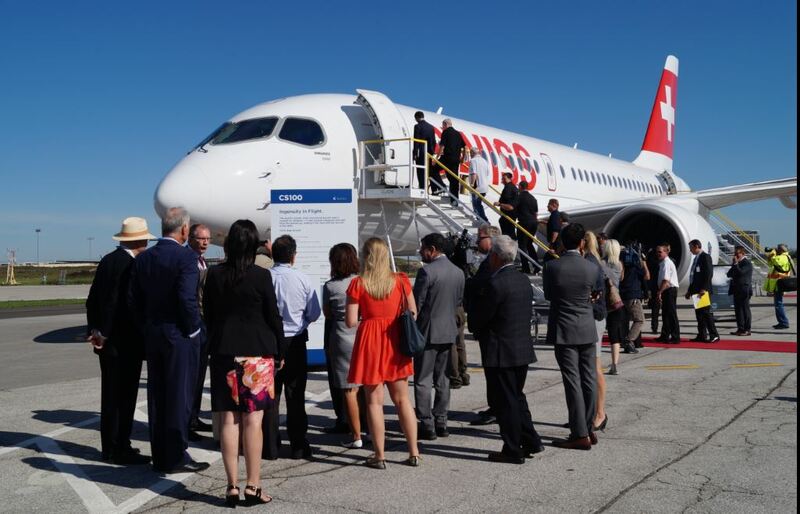 The message was loud and clear as the all-new Bombardier CS100 made its Toronto debut Thursday: It’s the quietest aircraft in its class. The CS100 is the smaller version in the CSeries and is on course for certification later this year. 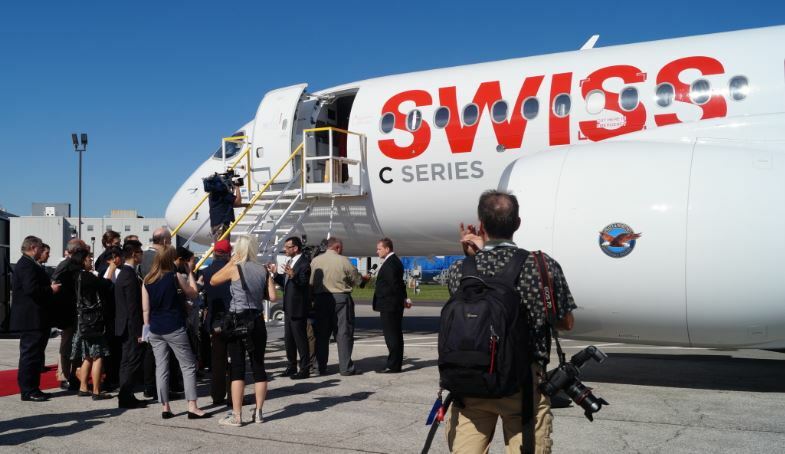 The aircraft that debuted in Toronto was in the colours of launch customer SWISS, or Swiss International Air Lines, and is expected to make the first commercial flight before the middle of next year. 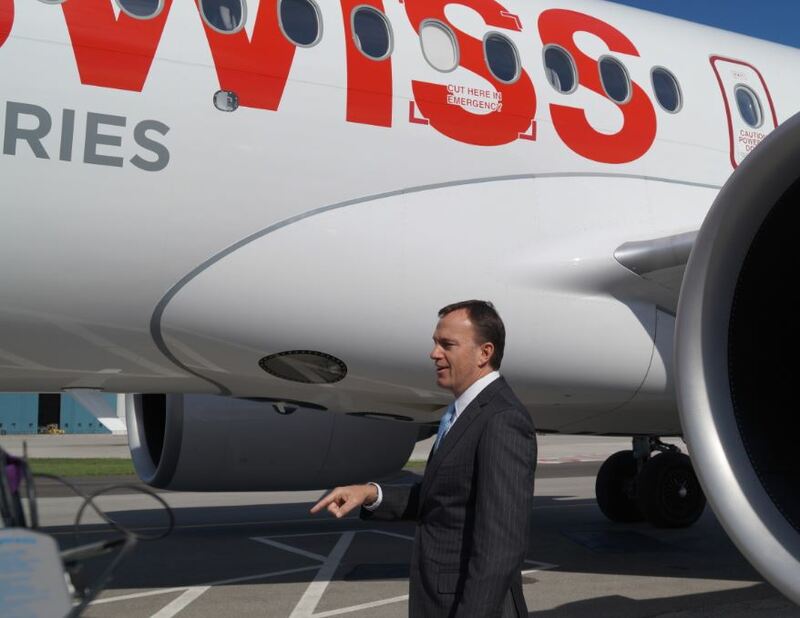 “We announced previously that the CSeries aircraft are exceeding their original targets for fuel burn, payload, range and airfield performance,” said Rob Dewar, vice-president of the program. 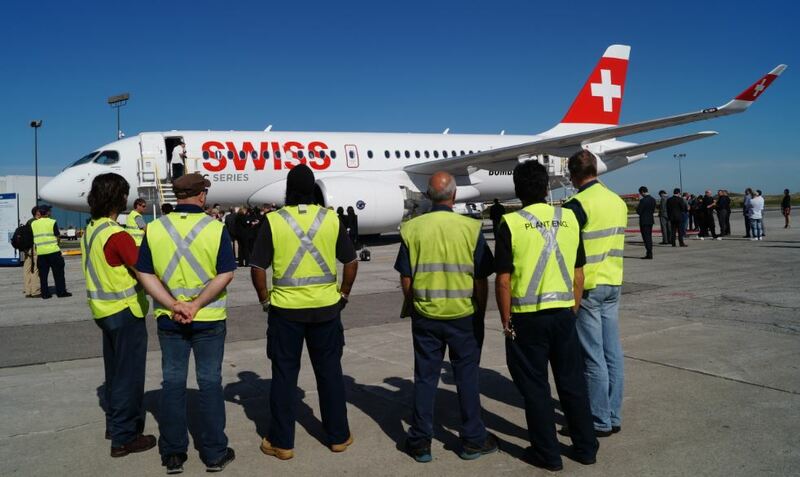 The company said the first production CS100 will soon start function and reliability testing, signalling the start of the final flight testing phase. No new orders were announced Thursday but Fred Cromer (above), president of Bombardier Commercial Aircraft, was very optimistic. “The momentum continues to grow,” he said. All images are by the author. 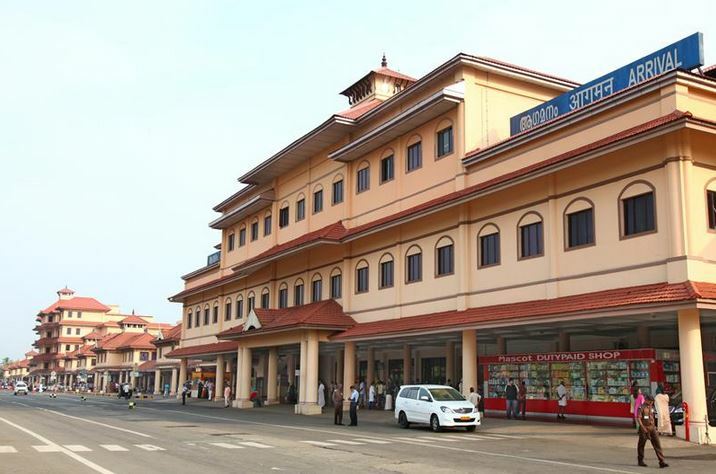 Cochin International Airport (COK) in southern India was opened just 16 years ago. This week it is celebrating a major environmental milestone – it has become the world’s first fully solar-powered airport. More than 46,000 solar panels laid across 45 acres are generating 12MW of power, enough to run the airport smoothly. 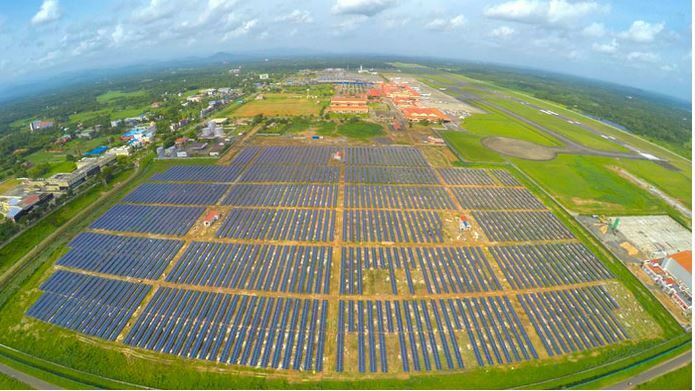 “Now, Cochin airport will have 50,000 to 60,000 units of electricity per day to be consumed for all its operational functions, which technically make the airport absolutely power neutral,” its operator, Cochin International Airport Ltd., said in a release. CIAL has been a trendsetter since its launch in the late 1990s. Cochin is the first Indian airport to be built under a public-private partnership model. The company forecasts the project will help mitigate carbon emissions by more than 300,000 tonnes in the next 25 years. That is equivalent to planting three million trees, it said. The busiest airport in Kerala state and the fourth largest in India, Cochin handled nearly seven million passengers in 2014-15. The project was built by Bosch Energy and Building Solutions. Images are courtesy of CIAL. 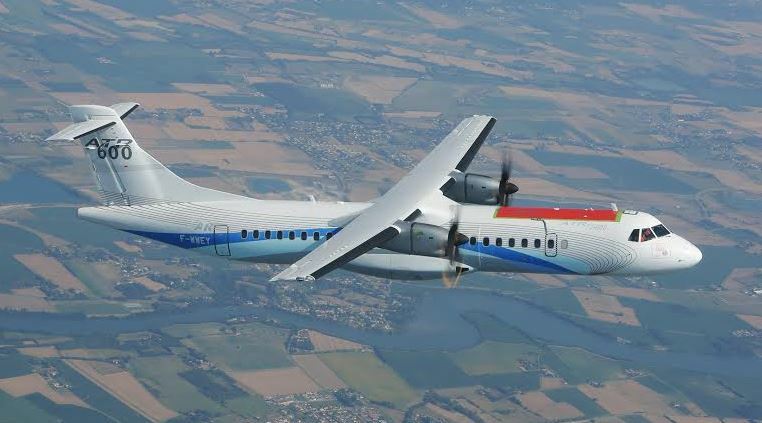 An ATR “green” aircraft has made its first flight as part of Europe’s Clean Sky initiative. 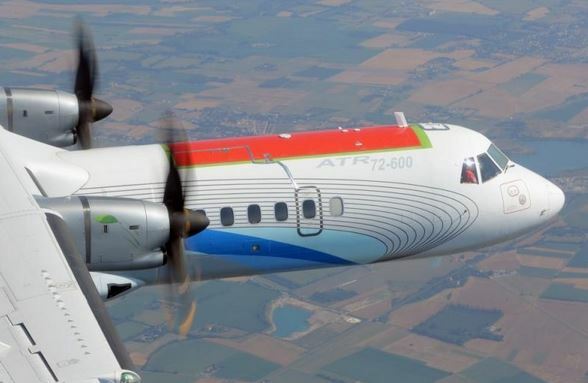 The Clean Sky Green Regional Aircraft Flying Demonstrator took off from Toulouse, France, at 10:30 a.m. Wednesday and returned two hours later. ATR said the purpose was to test new and more effective composite insulating materials and sensors integrated into a panel of the airplane’s forward fuselage section. The flight also tested new generation of optical fibres for improved identification of micro-cracks, the company added. ATR has been part of the project financed by the aeronautical industry and by the European Union since its launch in 2008. The aim is to reduce emissions and noise pollution by half by 2020 from 2000 levels. 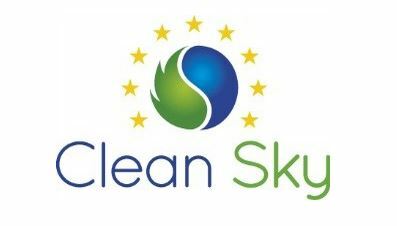 “Today’s successful flight shows the real progress accomplished in introducing large pieces of innovative materials in regional aircraft,” said Eric Dautriat, executive director of Clean Sky. A second flight, planned for later this year, will check out improvements to the electrical distribution, energy dispersal and the air conditioning systems. ATR is jointly owned by Airbus Group and Alenia Aermacchi of Europe. It has sold more than 1,500 aircraft to 190 airlines. Images are courtesy of ATR and Clean Sky. Boeing’s ecoDemonstrator 757 has made its first flight with U.S.-made “green diesel,” expanding the testing and use of technologies to improve aviation’s environmental performance, the company said Friday. The U.S. aircraft manufacturer said the 757 flew on June 17 from Seattle to NASA‘s Langley Research Center in Hampton, Va. Solar and thermal energy harvesting to power electronic windows, as a way to reduce wiring, weight, fuel use and carbon emissions. On the 757’s flight deck, Boeing has installed a 3D-printed aisle stand made from excess carbon fibre from 787 production to reduce airplane weight and factory waste. “With the ecoDemonstrator, Boeing looks to reduce environmental impact through the airplane’s lifecycle, from improving fuel efficiency and cutting carbon emissions to recycling production materials,” said Mike Sinnett, vice-president, product development at Boeing Commercial Airplanes. Boeing said NASA and the TUI Group of Germany, the world’s largest integrated tourism company, were collaborating on the tests. The ecoDemonstrator 787 made the first-ever flights with green diesel last December. Since it was launched in 2011, the ecoDemonstrator Program has tested more than 50 technologies, with 737, 787 and 757 aircraft, Boeing said. 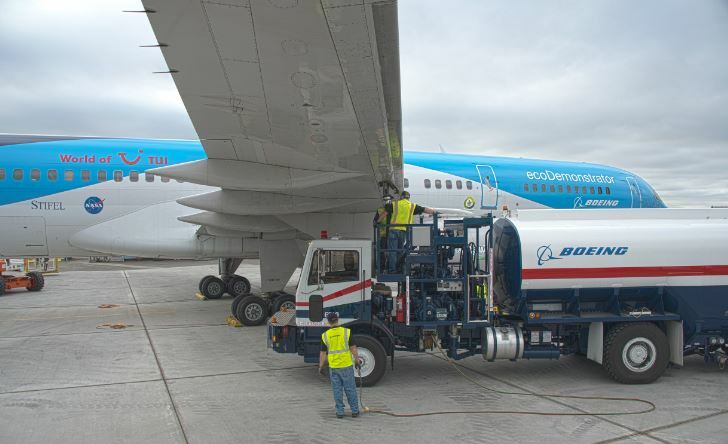 Boeing’s global initiatives to advance development of a sustainable aviation biofuel include a project in Abu Dhabi, United Arab Emirates, where it has partnered with the Masdar Institute of Science and Technology. Images are courtesy of Boeing and TUI Group. The Paris Air Show doesn’t open until Monday, but one airplane is already creating a lot of buzz. 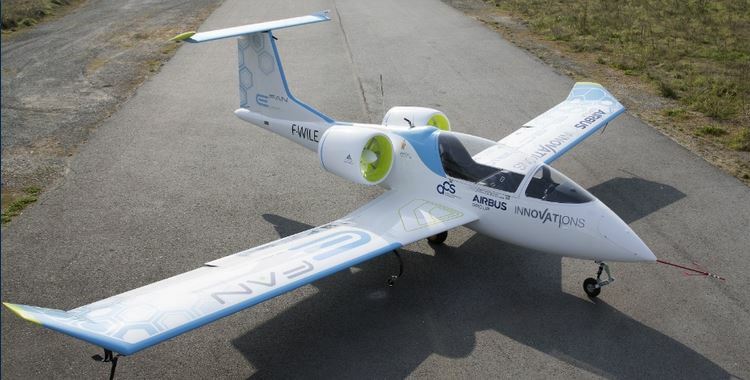 Airbus has unveiled the E-Fan, the environment-friendly plug-in plane. The European manufacturer says it will be the world’s first series production electric plane and will open the way for a new era in air transportation that is environmentally-friendly and highly efficient. The the E-Fan 2.0 (left) and the E-Fan 4.0. “The E-Fan demonstrator will be followed by serial production versions – first, the two-seat E-Fan 2.0 version for basic pilot training, then by the E-Fan 4.0, a four-seat airplane for full pilot licensing and the general aviation market,“ the company says on its website. The first flight for E-Fan 2.0 is planned for late 2017. It is expected to go into service the following year. “It will be CO2 emissions-free and nearly silent in flight, becoming the world’s first all-electric plane certified to international civil airworthiness standards,” Airbus said. The E-Fan 4.0 is scheduled to arrive in 2019. “E-Fan is a crucial step on Airbus Group’s journey toward all-electric aviation,” said Detlef Muller-Wiesner, head of Airbus E-Aircraft Programmes. Airbus subsidiary Voltair will manage the airplanes’ industrial evolution. Images are courtesy of Airbus. That is how Rogner-Bad Blumau describes the thermal water at the Austrian hotel’s spa. The supply is from the nearby Vulkania springs and is said to be the most mineral-rich curative water in the spa town of Bad Blumau. And the healing water is just one of many features that make this hotel out of the ordinary. 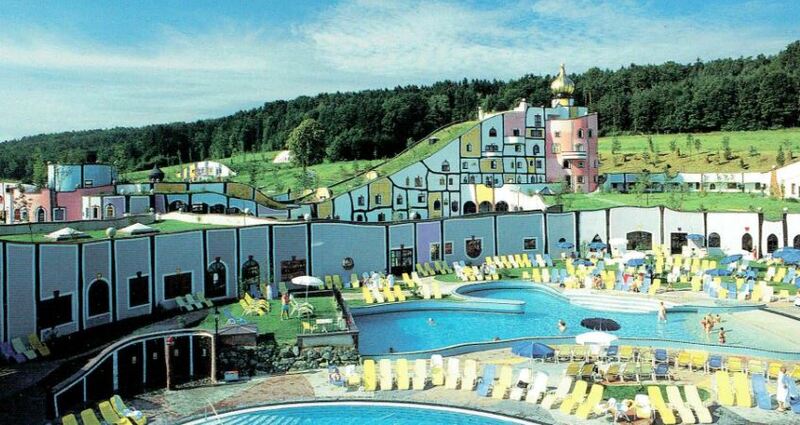 “Your name is Hundertwasser, I have water of hundred degrees,” businessman Robert Rogner told the artist as they began the work on the hotel in early 1990s. Rogner-Bad Blumau is unique in so many ways – the most compelling being the architecture itself. 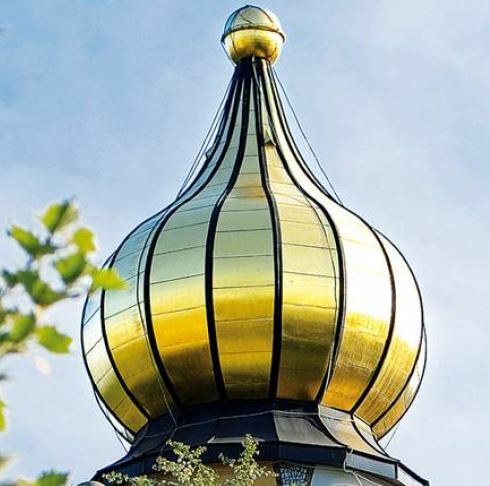 There are six “houses” connected by a maze of hallways and green roofs with golden onion domes. In addition to supplies from the Vulkania springs, the hotel’s numerous pools and bathing areas get water from the Melchior and Balthasar springs. Original roof tiles from old farmhouses have been used for the facade of one of the rainbow-coloured buildings. 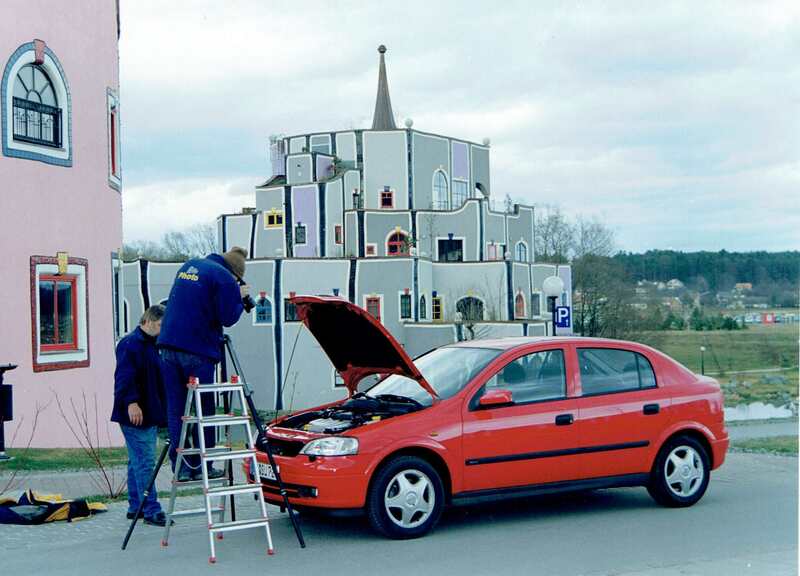 They all fit well with the philosophy of Hundertwasser: A life in harmony with nature. “The great thing about Blumau is the uniqueness,” said Jasmin Rogner, co-owner of the 312-room, four-star hotel. “It’s a great artwork, which rather increases in value with time,” she wrote in an email. 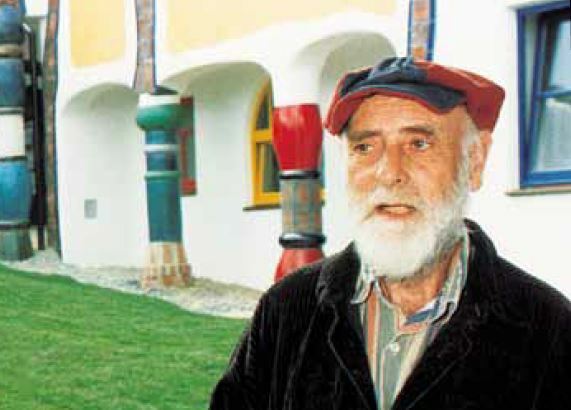 Hundertwasser died in February 2000 in his adopted home country of New Zealand. The hotel sits on the beautiful rolling hills of Bad Blumau, less than an hour from the city of Graz – a UNESCO City of Design and the hometown of Arnold Schwarzenegger. I stayed at the hotel back in March 1998, barely a year after Rogner-Bad Blumau opened its doors to first guests. I was among a group of journalists flown in from around the world for the launch of a new General Motors car, Opel Astra. The hotel has since become a major site for product launches and corporate events. The property is owned by Rogner International Hotels and Resorts. Bad Blumau is easily accessible from Graz, Vienna and Salzburg. Austrian Airlines has direct flights from Toronto to Vienna while Lufthansa offers flights to Graz from several German cities. 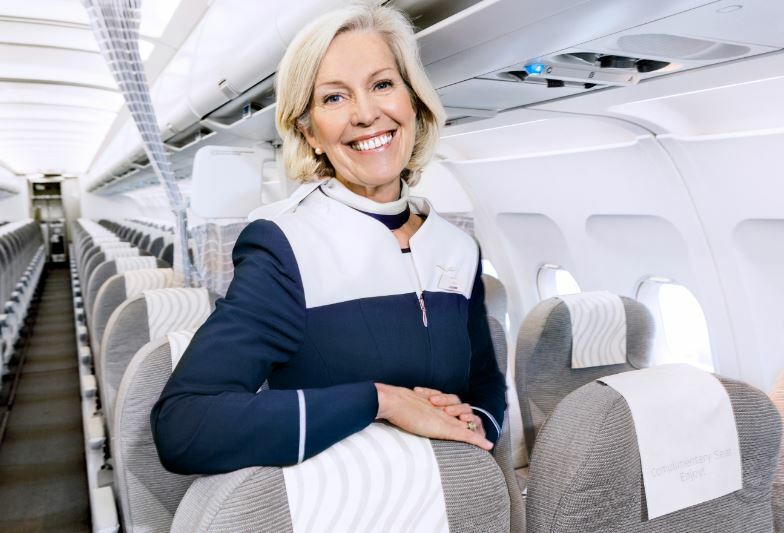 The organization that represents global airlines says Finnair and South African Airways have become the first carriers to complete the highest level of its environmental assessment program. The International Air Transport Association said Tuesday they completed State 2 of the IATA Environmental Assessment, or IEnvA, program, aimed at improving an airline’s environmental management. “This ensures that an airline has implemented all of the IEnvA program standards, identified and mitigated its significant environmental impacts, and has set performance targets,” IATA said. Meanwhile, Icelandair, Qatar Airways and SriLankan Airlines completed IEnvA Stage 1, joining Air Transat, Kenya Airways, LATAM, LATAM Cargo and Malaysia Airlines. Five years ago, the industry agreed to cut net carbon emissions by 50 per cent from 2005 levels by 2050. “This certification is proof of our commitment to environmental leadership within the aviation industry,” says Pekka Vauramo, Finnair’s CEO. There was no immediate comment from South African Airways. Images are courtesy of IATA, Finnair and South African Airways.